This recipe for cooking salmon fillets comes from my good friend Prema, and it is all thanks to her status message on Facebook which mentioned that she had cooked salmon for her family’s dinner. But there was no recipe. Naturally I had to ask her for it, and she provided me with some simple instructions. I followed her fishy (just kidding, Prema! *wink*) advice to use plenty of freshly ground coriander seeds, but changed the spice rub mix somewhat because of wanting to try out the Za’atar (a Middle Eastern spice mix of sumac, thyme, sesame seeds, marjoram and oregano) that had arrived from Amazon. I was slightly worried that the sesame seeds would just fall off the salmon, so I pounded the Za’atar (not the whole bottle, just the amount I was going to use) and coriander seeds in a mortar and pestle. I have to say it worked fine. When I bought the salmon fillets, I hadn’t noticed that the fishmonger had put two free pats of some kind of herb butter (I assumed herb as it was greenish in colour!) in the pouch. I guess the idea was to bake the salmon in the bag and let the butter flavour the fillets. But I didn’t notice this until I had cut the pouch open. For a moment it was disconcerting because, you know, there’s no un-cutting a cut bake-in-the-bag bag. Then I remembered that I was not going to cook it that way anyway, I was going to follow Prema’s advice! I felt pretty sheepish at this point, but luckily there was nobody around to see my expression, even if my initial dismay and subsequent relief was all in my head! I used the butter too – I didn’t want to throw the pats away, and I couldn’t use them for cooking anything else because they had had a very intimate relationship with the raw fish fillets. So in the end I just placed them on the fillets just before putting them in the oven. I figured that the butter would melt and leave behind the herb flavouring, and I was right. When the fillets were cooked, I simply removed them from the baking tray, leaving the melted butter behind. Oh, and another thing – I used a really fancy salt (Hawaiian red clay sea salt) that I’d bought from an organic supermarket called PCC, when I was in Seattle last month visiting my family. I used it in this recipe because I suddenly remembered that I had not yet tried this salt. It’s a reddish colour (hence the name, duh) but basically it tastes just like salt. There were lots of other gourmet salts to buy there but I restricted myself to just three types because PCC, while being a fabulous place for great food and grocery, all organic and preservative-free, is FREAKING expensive! I deliberately didn’t use all the marinade for the fish because I wanted to do as Prema had suggested, and use the marinade to roast some potatoes to serve with the fish. Softer vegetables (like peppers or tomatoes) can be put in the oven to roast along with the fish fillets, but if you’d like to use potatoes or parsnips, given them a 10-minute head start in the hot oven before putting the fish in. Anyway… I’m definitely liking cooking fish, because it’s simple, quick or simple AND quick. I’m beginning to realise that cooking small portions of fish is not really a problem. The time to worry is when I’m faced with having to cook an entire salmon, but I think that will not be taking place this side of never. 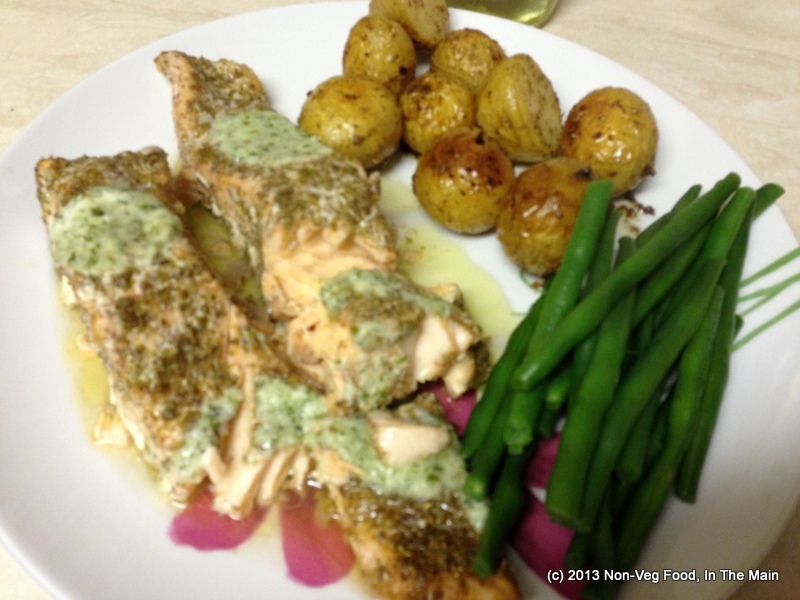 This entry was posted in Fish and Seafood and tagged coriander seeds, Hawaiian red clay sea salt, herbs, lime juice, olive oil, salmon fillets, sea salt, Za'atar on February 16, 2013 by shyameds.